Every component of your Leupold® Mark 4® LR/T® variable power riflescope is working together to help you make every shot count, whether you’re at the range, hunting, or in tactical environment. Leupold 8.5-25x50 Mark 4 Long Range Tactical 30mm M5 Rifle Scope 113092 is incredible accuracy in a cutting edge, robust design. The Leupold Mark 4 LR/T 8.5-25x50 M5 Riflescope features .10 mil adjustments and answers the call for extremely accurate long range shooting. Mark 4 LR/T riflescopes from Leupold delivers dead on targeting each time you go out target shooting or hunting. As a member of the Leupold riflescope lineup, the Mark 4 series include some of the most devastatingly accurate riflescopes on the planet. The Leupold 8.5-25x50mm LR/T M5 Metric fulfills the hardened requirements that its fellow rifle scopes have led hunters and target shooters to expect. The illuminated Tactical Milling Reticle (TMR) allows for precision shot placement in low light. 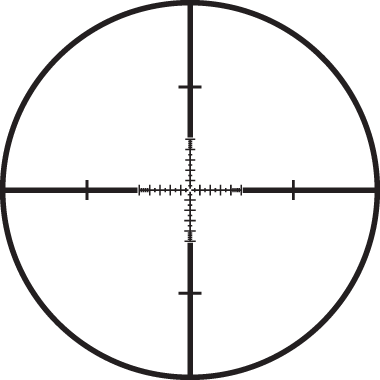 These reticles provide accuracy of range estimation for hunters and target shooters. The Leupold Index Matched Lens System delivers unsurpassed sharpness across the visual field, brightness, and contrast for excellent target definition, even in low light. Side focus parallax adjustment for fast, easy parallax focusing from 75 yards to infinity, from any shooting position. Once sighted in adjustment knobs can be zeroed. 75-MOA of elevation adjustment and 70-MOA of windage adjustment. Flip-open lens covers are standard issue with each Mark 4 LR/T riflescope. Rugged and absolutely waterproof, LR/T riflescopes can withstand incredible abuse. Leupold Mark 4 LR/T 3.5-10x40mm LR/T M3 Illum. Ret.